I've seen a few beauty bloggers rave about the brand Treacle Moon, so after jumping in my car to my local Tesco I picked up the 'That Vanilla Moment'. I was not disappointed, the formula and scent is great not to mention the price! £2.99. Then a little while after I found a new amazing blog 'We Were Raised By Wolves' which is full of great blog posts, one of which was about the new Treacle Moon Limited Edition 'Iced Strawberry Dream'. I'm not going to lie, I took one look at the bottle and was totally won over. I couldn't have cared less about the scent I wanted it for the bottle ha ha! But I'm happy to report the scent is just as sweet as the pretty prints adorned on the bottle. 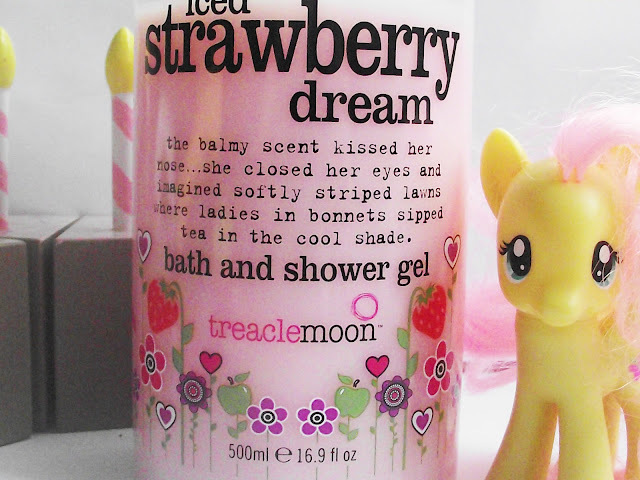 If you're a fan of Lush's Snow Fairy you'll love this, it's not exactly the same scent but it is sweet and smells like strawberry milkshakes and sweetie shops! The packaging is very similar to Philosophy but thankfully these won't set you back as much. 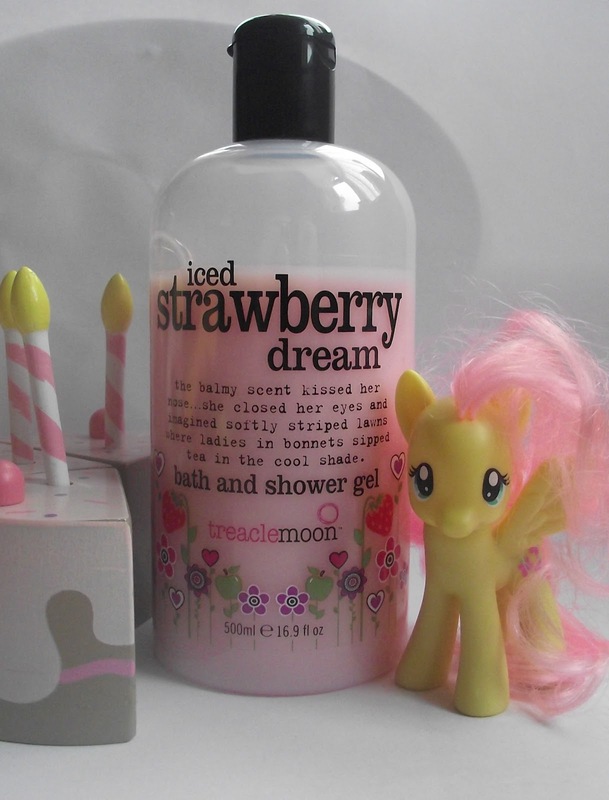 Sadly Iced Strawberry Dream* is a limited edition scent which is such a shame so if you like the look and sound of this scent I suggest you pick up one or maybe two when you're next at your Tesco or online if your Tesco doesn't stock it. Each month Treacle Moon recieve stacks of fragrance suggestions, so they pop them down on a league table then twice a year they work on the most popular one and bring it to life! How exciting hey? This one was launched begining of June so I'm guessing there will be another one coming out Christmas time which would be amazing and just imagine the scent! I'm thinking 'Candy Cane Christmas' or 'Coated Candy Canes' sounds like a good one, plus they could have candy canes and Christmas trees printed on the front! Wouldn't that be amazing!!! You can pick this one up as well as their other scented products online www.treaclemoon.net and also from Tesco Stores. Have you tried Treacle Moon?